History and Historical Fiction – We make history fun! April 16, 2019 April 16, 2019 historicalnovelsrusLeave a Comment on New York City Secede? 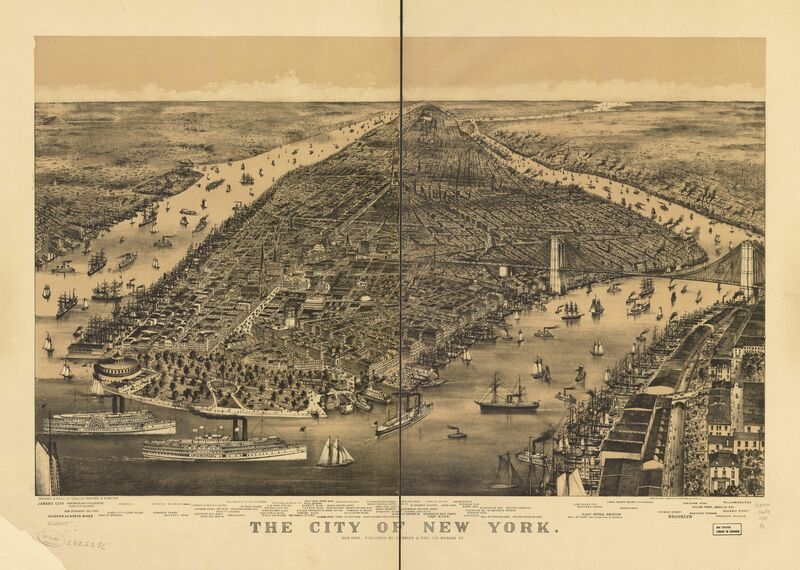 Did you know… New York City wanted to secede? This week’s Civil War story is from the New York Historical Society. The picture does a cartoon depiction of the two 1864 political conventions – Democrat in Chicago, Republican in Baltimore, and New York City in the 1850s. Most people would think that New York, apart from supplying men and materials for the Union army, would not have been much involved in the North/South or slavery debate. But New York has always been a place of business, and in 1861, businessmen in New York very much cared about cotton and slavery. An estimated eighty seven percent of the world’s cotton flowed through New York in the mid-1800s. So although New York abolished slavery in 1827, the businessmen there were still highly invested in the output of the plantations in the South. In December 1860, South Carolina became the first state to secede, but on January 7, 1861, New York City Mayor Fernando Wood suggested that the city follow suit, becoming independent of both North and South. “Many New Yorkers gave Lincoln a cold shoulder when he visited on his way to the inauguration,” according to Lincoln and New York. Mayor Wood hoped to capitalize on this hatred, saying independence would be “disrupt[ing] the bands which bind her to a venal and corrupt master.” According to the New York Historical Society, “White newspaper editors praised slavery as a benevolent system of labor and the only fit condition for people of African descent in America. Discrimination and ridicule greeted black New Yorkers every day.” This is hardly the attitude we expect from the “melting pot” of America. Mayor Wood suggested that New York become a “free city,” independent from both the North and South, in order to not lose business to seceding Southern states. Wood’s call for secession was hardly surprising. A Democrat, he had been elected in 1859 on a vocal pro-Southern platform in a three-way election against a Tammany Hall Democrat and a Republican. What’s more, pro-Southern and pro-independence sentiment was widespread in New York, particularly among the merchant class. Southerners threatened to blacklist Northern companies they felt sided too closely with the Union and to unilaterally cancel debts owed to Northern merchants. New York’s elite — and the city’s economy — would be devastated.Following Lincoln’s election, many city leaders declared their sympathy for the South rather than the incoming Republican administration. On Dec. 15, 1860, 2,000 merchants met in an “Appeal to the South” — where even a nominally pro-Union speaker swore his loyalty to the “white race” should war come. In late January, a committee of city leaders from New York and Brooklyn delivered a petition to Washington with 40,000 signatures in favor of compromise with the South rather than war. A plot was hatched, never executed, to seize the military assets surrounding New York City, and use them for the new independent city state. However, according to the New York Times, the first shots fired at Ft. Sumter ended all that, with New Yorkers banding together to defend the nation. “The tidal wave of support for the Union overwhelmed secessionist sentiment in the city. New York, alongside the rest of the North that April, proclaimed its loyalty to the United States. On April 20, hundreds of thousands of New Yorkers gathered in a massive patriotic rally in Union Square, by which time New York had already begun to provide vast amounts of money, men and supplies that would save the Union over the next four years. The South, meanwhile, fumed. “New-York will be remembered with especial hatred by the South to the end of time,” raged the Richmond Whig on April 22. “Boston we have always known where to find; but this New-York, which has never turned against us till the hour of trial, and is now moving heaven and earth for our destruction.” – NY Times, John and Charles Lockwood, Jan 6, 2011. Previous Did you know… Martin Delany?